So I would like to write down a piece of info for everyone to use, about axles. Also for archive purposes. This is not about what can be wrong with your axles, this is about the unknown options that you have, if you want to improve your Hi-ace. Wheel PCD is usually 6x139.7mm (but there are 5 lug models). This means you can use rims (and spacer) from any off the major 4x4 models from Japan or USA brands. However, while you can use 16 inch rims, you have to take care of maximum tyre size and wheel offset. 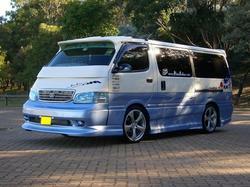 Every Hiace is likely to be fitted with a G type rear axle, most likely G144 or G155. This is an axle with an 8 inch rear differential, which can also be found under a 4Runner and a Hilux. However, the final gear ratios can be very different. The PDF helps to translate the codes to final gear ratios. Or G52 with engines like 2L or 3L. Also the petrol versions with 2RZ engines came with G52 or G55 tranmission. Toyota Hi-aces have been optionally fitted with these differentials. They are based on the viscose principle, and therefore need special oil for them to function correctly!!! The same kind of differential oil you would otherwise buy, but then the LSD type. If your Hi-ace came with an LSD, it also came with a slightly higher final gear ratio! 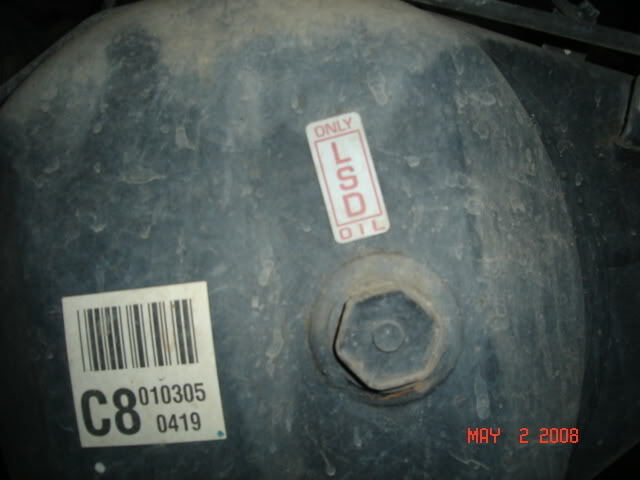 To identify if you have an LSD type, check the axle code on the chassis plate, and see if it ends on number 5 (instead of 4). If so, you have an LSD, so take care of the oil type. If you choose to source a nice axle with LSD (or lockers) from an Hilux or 4Runner, it will fit, but the final gear ratio might be different. This will cause a different highway rpm, which maybe is not so bad. But if you have 4x4, the you have to pay attention because you don't want a different final gear ratio in the back, different from the front differential (same goes with tire sizes). Because it will wear out your drivetrain much faster, because of a difference in rpm of front axle and rear axle. Be aware that an LSD with high mileage (and wrong oil usage) can be worn out and not effective anymore, becoming an open diff. While Toyota has not offered them in the Hi-ace, you could source them from 4Runner axles or Hilux axles having selectable lockers. Again, same applies as above, so pay attention. Next to that, there are aftermarker locking diffs available from brands like ARB etc, which allow you to lock the differential with a button (selectable lockers), using an air pressure system. This is quite expensive, but very powerful. You have to search for Toyota 8 inch diffs, because nobody will offer anything for a Hiace. But the price level is much much lower, and they will work quite well. They can be found from brands like detroit locker or lock-right locker. The nice thing is that you only exchange the internals of the differential, so you keep the pinion gear, and the final gear ratio stays the same, so you don't have to worry about that. Of course, this only applies to 4x4 models of the Hi-ace. The front axle is an IFS setup using torsion bars as suspension. Very similar to 4Runners, but suspension parts cannot be exchanged. The front differential is the same however, it is an 7.5 inch differential. They only came as open differentials on the Hi-ace. But again, there is the option to buy an auto-locker, starting from a bit more than $300. Search for auto locker toyota 7.5 inch differential, and you'll find useful stuff. As said, you only change the internals, so the gear ratio stays the same. You could also buy a Detroit Truetrac for a 4Runner, and it will fit the Hi-ace. It is more close to an LSD than to a locker. As said, both cars have a 7.5 inch differential in the front, and you don't have to worry about final gear ratio, as you only replace the center. - Try to find a LSD if you don't have one. An auto-locker is an option, but it might become somewhat tricky when using the throttle in the corners. - Try using a LSD or auto-locker in the rear. - If you already have an LSD in the back, I would suggest to go for auto-locker in the front. This is what I'm going to in the end. The nice thing is that having an LSD drives like any other car, it's just helping when your stuck. An auto-locker is somewhat more tricky in the rear, but not in the front. Especially if you disengage the front axle, when driving on normal road. - If money is not a problem, buy lockers for front and back, which you can lock by pressing a button (like ARB difflocks). Then you will apply power to all 4 wheels simultaneously! But as said, nobody is offering anything for a Hi-ace. So you have to search for Toyota diff in 8 inch (rear) and 7.5 inch (front). This is it for now, maybe I'll add more stuff later. Let me know if anything is unclear or missing. Hi, I have a 97 2wd 2L Turbo with an automatic transmission. I was checking my wheel alignment and I noticed the rear axle isn't quite in line. Is there any adjustment on it? I think it would be better to make a new topic for this. But I think you have rear leaf suspension. So if the alignment is off it could mean that the centerbolt is broken. if you want a workshop to check the centerbolts, you want to have new ones ready to put in. Thanx, I will make a new topic. It has coil spring suspension. Thank you so much Hiace4wd, this is very useful information. I also really like your van, this is pretty much what I am going for. I was still shopping for one and I just found one. took me about 3 month. It is 1999 KG-LH168V 5L 3000cc 5MT diesel with with a very moderate milage. Pretty happy finally finding what I was looking for. I was actually looking for a Commuter but 4wd diesel commuters never come with 5 doors. My must have items were 4wd, diesel, MT wiit 5 doors. Anyways, back to the transmission question. 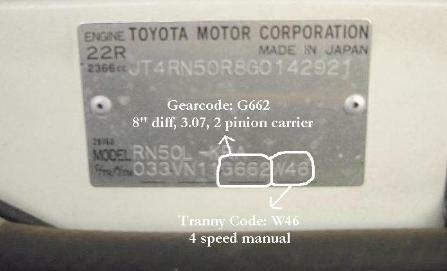 Trans/axle are G52 and G142. Do you know if G142 is LSD or not? ARB air locks being expensive and open locks not, just a rough ball, whats the difference? Also, can you pls refer to any more detailed info on high gear ratio that I need to be aware of? I am planning and extended trip and anticipating a lot of highway time so I don't' want to rouine my chassis early into the trip. Hi the g142 is 4.875 final gear ratio - open diff (no lsd) but with two pinion instead of 4 pinion. 4 pinion is stronger but I doubt you will notice the difference, only when you push it to the limit a lot. What do you mean by open locks? The cheaper automatic lockers called detroit locker or lunchbox locker? What do you mean with ruining your chassis? I meant to say open diff. So I have to be looking for G155 if I want lsd? What kind of driving do you want to do with the van? How rough will you take it offroad? Maybe you can check some YouTube videos which explain a difflock, and difference to open diff and hopefully LSD. Finding a g155 might be hard, and the original LSDs can be worn out easily. It may be more efficient to buy a truetrac LSD. The LSD is a nice-to-have but rarely essential- bear in mind that most Land Rovers (and I mean Series LRs and Defenders, not Discos/RRs..) came with open F+R diffs and they are pretty capable out of the box. If you want to retrofit for extra grip then just get aftermarket lockers. Do you have 4WD with transfer case and low-ratio, or a viscous coupling/AWD? I agree with the first part. Not with carrying a set of extra wheels, for the simple reason that it will only make things worse. A high roof load is a high center of gravity, that and the added weight is not good for offroading. I just use all terrein tyres and frankly, they are doing fine. You could argue about true mud tyres, of course they work but are only relevant if you want to take real muddy tracks. And I usually dont take them. Standard tyres are fine in sand or in the mountains, usually dry surfaces. The occasional mud pool isnt an issue but I avoid it when it is one big mud bath. Mud tyres only get you stuck further. The hiace with parttime 4x4 and low gearing is already very very capable. You can argue about tyres and difflocks but in most cases you will be limited by the ground clearance which is not as high as a standard 4x4 jeep. That is typically the first thing that you run into. Thank you very much for your very informative post! I have a 1994 4x4 Hiace with 2.8l non turbo diesel. Apparently originally with LSD but now it's not working at all. I'm looking at buying Detroit Truetrac but want to make sure I get the right one since I can't find them in the UK and would need to order it from States or Australia. I can't find any chassis plate next to the seat, there's only vin number there. So is the diff 2 pinion being non turbo, correct? There are two for 8 inch Toyota on eaton website - one for 2 pinion diff and one for 4. @mudnomad, you are probably looking on the right side of the vehicle. You should look for the VIN plate, which is under the left chair, when you open engine cover you see it, above the wheel. You can buy a true trac, but you can also buy a replacement clutch parts and shims for your LSD to have rebuilt. This is cheaper, but will be worn out at some point, the True Trac does not wear out. Both jobs should be done by someone (some 4x4 shop perhaps) who know to work on diffs. So it is a 4 pinion option, correct? » Information: Disabling Facebook connect Module + Facebook "Like" Button + Paypal. » posting inaccurate information, how to stop it? Can it be stopped?